Parma ham and seabass come together to form a surprisingly delicious combination of flavours. Saltimbocca means ‘jump in your mouth’, and the flavours in this recipe do exactly that. This version is made with seabass and delicately sliced Parma ham in a tasty tomato-based sauce, served with buttery gnocchi and showered with Parmesan. While making the sauce for this is so much easier using Knorr Tomato Pronto, preparing the gnocci is still a delicate, time-consuming process. Watch the video below to see how to simplify it even further using one of our modern convenience ingredients. Tip video: Learn a simpler way to prepare gnocchi! When you can’t find the right potatoes, use Knorr Mashed Potato for a smooth, consistent base for your gnocchi. Add basil at the last moment so it keeps its fresh taste. Finish with grated Parmesan cheese. Instead of seabass, you can use other white fish such as cod. If you don’t have Parma ham, you can use other types of dried ham or bacon. Nutritional tip: Did you know? Bass is low in overall fat and is also a source of omega-3 fatty acids. How do I create perfectly golden gnocchi? Using clarified butter to fry the gnocchi will help avoid giving them black spots. 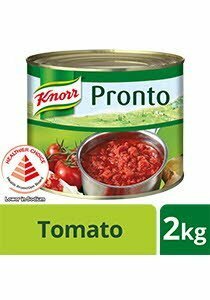 Made with sustainably grown Italian tomatoes, Knorr Pronto Tomato is a ready to use concentrated tomato sauce that is ideal for a wide range of dish applications. Simply add desired amount to enrich soups, sauces and meat or fish dishes for authentic Italian taste and flavours. 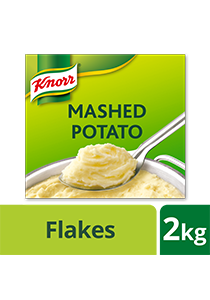 Knorr Mashed Potato flakes are made with 99% sustainably grown German potatoes to help you create perfect fluffy mashed potato in less than 5 minutes. Simply combine with milk and seasonings, or your own selected ingredients, to create delicious creamy mashed potatoes. Knorr Mashed Potato is also perfect for creating toppings for pies, fillings for croquettes, or even as an ingredient for soups..